The Alchemist from the Vampire Academy series, Sydney Sage, moves to a boarding school in California to protect Jill. Eddie accompanies Jill, and the three pose as siblings. Adrian tags along, but he doesn’t join the boarding school. 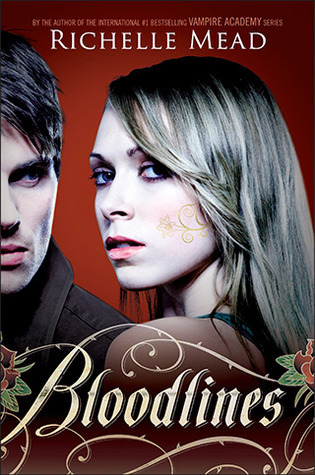 Someone has been using vampire blood to make performance enhancing tattoos, and someone has been killing young girls. An attempt was made on Jill’s life because she is the sister of Queen Lissa. If they kill Jill, Lissa would have to give up the throne, since a Moroi must have at least one other living family member to be king or queen. Sydney’s sister, Zoe, was originally supposed to take the job, but Sydney convinced everyone that she was better for the role since she is more experienced and better prepared. In reality she wanted to protect Zoe from Keith and the Alchemist world in general. Adrian is placed in a house of a fellow Moroi – Clarence Donahue. Clarence’s son Lee also lives there. Clarence is a bit crazy, and is convinced that vampire hunters killed his niece. Is he wrong? The football team at the boarding school have been getting tattoos that enhance their performance. Clearly magic is the behind this. These tattoos are very similar to the Alchemists’ golden lily tattoos, and Sydney knows something’s up. In order to get Jill away from a human senior, Micah, who caught her eye, Sydney and Adrian set her up with Lee Donahue. After lots of weird scenes and experiences, Jill admits to Sydney that she and Adrian are bonded like Rose and Lissa were. Adrian brought Jill back to life when she was killed back in the Moroi court. So now Jill can experience Adrian’s emotions, thoughts, and actions. Sydney is assigned to help her history teacher, Ms.Terwilliger, with whatever she needs. Ms.Terwilliger asks Sydney to read and summarise a Latin book about magic. Adrian and Sydney go to investigate the tattoo parlour. Adrian distracts the employee (in a hilarious scene, might I add) while Sydney looks around. She discovers vials of vampire blood (gasp! ), metallic liquid, and a weird clear liquid. Ms. Terwilliger asks Sydney to make an amulet that bursts in to flames using the Latin magic book. Sydney keeps it in her purse. Sydney and Adrian discover that Keith has been taking blood and saliva from Clarence and selling it to the tattoo parlour. Sydney goes to confront Keith at a diner while Adrian breaks into his apartment. It’s revealed that Sydney hates Keith because he raped her older sister. Keith goes back to his apartment, where he is arrested by the Alchemists, who were called by Adrian. Lee reveals that he is the one who has been killing girls, and he was the one to kill his cousin. Lee used to be a Strigoi before he was turned back into a Moroi, but he wants to turn back. Lee ties Adrian and Sydney together in Keith’s apartment, and two Strigoi arrive. The Strigoi try to turn Lee, but he dies instead. They try to feed on Sydney, but her blood is gross or something and so they turn to Adrian. Sydney uses the magic amulet and it sets on fire, shortly before Eddie arrives and kills the Strigoi. Sydney speaks with another Alchemist for a debriefing, who says that the Alchemists will look into the thing about Lee not being able to turn back into a Strigoi. It seems as though once you are saved from being a Strigoi, you can’t turn back. Ms. Terwilliger reveals that she knows about vampires and Alchemists, and that she thinks that Sydney is magical. In a witch-y kind of way, not the other. Rose’s father, Abe, arrives with Angeline, a Dhampir. Adrian realizes that Abe had probably been trafficking the vampire blood. Abe lets him know that the reason Sydney owes a debt to Abe is because she asked him to attack Keith after Keith raped her sister. Sonya Karp and Dimitri Belikov arrive. DUN DUN DUN.